What are the best practices in face-to-face asking? One my Major Gifts Coaching organizations asked me this question last week. They were ready to dive in! 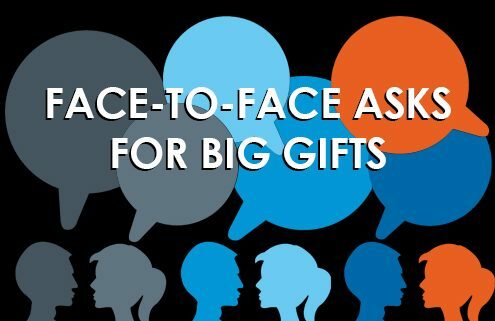 Today I’m sharing a summary of what I’ve learned over the years about face-to-face asking. Just a head’s up – my Insiders members are getting special coaching on successful face-to-face asking this year. I’m even going to do some role plays with them! If you want my help, join us now during our membership sale – it ends Tuesday! Ah yes, the Big Ask. Moment of truth. Why do you need to master face-to-face asking? We all know why. It’s when we actually get to sit down with a donor and request their support. It’s the fulcrum point of all fundraising. All of this cultivation, meeting and entertaining is for nothing unless you are able to sit down with your donor and discuss a gift. 1. Warm up your donor before the ask. Warm up is everything if you want to be successful. 90% of the work and conversation happens BEFORE you ask. Why? Because a successful ask is a process. It’s not a one time pitch. You find out about her motivations for giving. You find out if this is a good time to ask. Or not. Timing is everything! I like to gauge my donor’s level of interest well before I ask for a gift. That way I know what to expect. I also like to ask for permission to ask. Is this a good time? Would she be interested in this discussion? Never, ever surprise your donor with an ask. Because then it will feel like an affront, and you have destroyed some of the trust in your relationship. Make sure your energy is happy and optimistic. Why? Because your energy is contagious – your donor can feel if you are nervous or afraid. If you are enthusiastic and excited about your organization and your project, your donor will feel that too. Jerry Panas says he believes in the 3 E’s: Empathy, Energy, and Enthusiasm. Empathy allows you to truly enter the world of your donor. Energy helps to spark enthusiasm and joy. Enthusiasm gets you to the heart of things – and may be the most effective ingredient of all. I’m not kidding when I suggest that you “up” your energy. What are you communicating with body language, your smile, your eye contact or your tone? 3. Make it a conversation, and talk only 25% of the time. Practice up on your listening skills. The more you listen, the more you’ll learn about your donor’s wishes and desires. And your prospect is more willing to “buy” when he’s doing the talking. Listening puts the spotlight on your prospect and makes him comfortable and happy. Do everything you can to create interaction with your donor. Keep touching base with her. Ask her opinions and impressions. What are her hopes and dreams? What would SHE love to accomplish? Ask questions to get her to respond. The more questions you ask, the more you’ll discover about her. Try to find opportunities for her to comment and talk. Your focus needs to be on her, NOT on what you have to say. This is truly donor-centered asking. 4. Make it all about the IMPACT your donor can make with her gift. This is where it gets exciting. That’s where the energy is. “Donors give to the magic of an idea,” says Jerry Panas. Paint a picture about possibility and potential. What good things are possible with the donor’s help? Talk about the possibility of a happy future. This will make your donor smile. You’re sketching out the wonderful results and impact the donor can have – a future vision of something wonderful. Make the ask about an opportunity. Not a need. Talk about the gap between what you CAN do and what the need is that you can’t fill. If you reframe your solicitation into an opportunity, things change. It’s no longer about the money. Instead it’s about the impact you and the donor will be making. And it feels concrete. 5. Use the MPI Formula – Connect your ask with the impact. The MPI Fundraising Formula forces you to be crystal clear about your ask. It helps you define the money you want to raise and its ultimate impact. I like the the MPI formula because it connects the donor to something specific. It presents your effort in a precise, easy to understand format. Don’t make a generic ask! Make it specific. And most of all, connect the amount of money to the impact that the donor can make. I’ve been part of way too many generic asks that could have been so much stronger if they had more specificity! 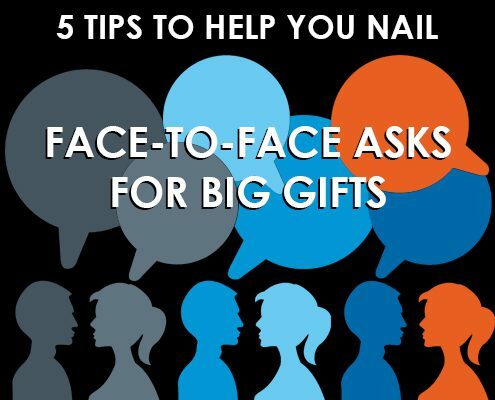 How are YOU doing with your face-to-face asks? Leave me a comment and let me know! And if you need more training in all aspects of 21st century fundraising, join my Insiders professional learning community. You’ll get proven, specific actionable training to help your organization raise the most money possible this year. 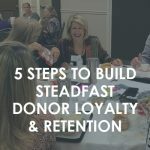 5 Steps to Build Steadfast Donor Loyalty & Retention in 2017 They really did say all this stuff!